XM1800S, Dynamic Microphone from Behringer in the Ultravoice series. Computer sound input, diverse and varied recordings. I am willing to do some tests with people in my region to see how it does in terms of quality. Philippe 3410's review"Excellent value for money"
John Music Animation's review"All right for the price"
I've had them for three years. I bought them for karaoke, I wouldn't let the clients touch my Sennheiser mics. 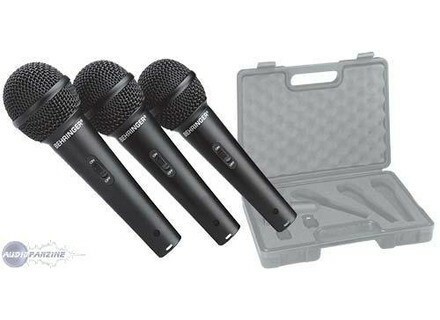 I paid $40 for the three, their value for money is truly excellent, they come with mic clips and transport case. so_hell's review"Very good for the price"
Set of three dynamic microphones for vocals with on/off switch. They come together with mic clips inside a padded plastic case. 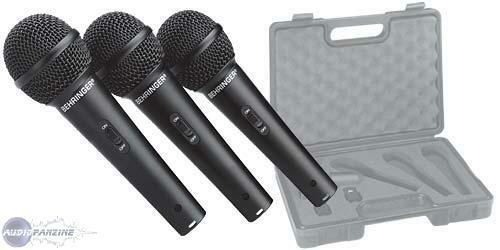 Very practical set of mics you can get very cheap at Thomann. I've used them for 7 months with a blues-rock group (in the "shout as loud as you can" style, so clarity and perfection are not the main priority). No issues so far: No cut-offs, nor feedbacks, neither in rehearsal rooms nor in concert halls (mainly small halls with the speakers relatively near). The manufacturing quality and packaging are more than fine, considering the price. With such a price there's probably no other product that can even compete with them! That said, I still have to see how they age, because you can't really tell after only 7 months. But that's not too bad: You get 3 mics in the box and for less than what you'd pay for only one of any other brand! This set is perfect when you are on a budget and need extra mics, to start out or for vocal styles that don't need too much precision! Anonymous 's review"If you need a lot of cheap, acceptable mics FAST..."
These microphones are not great, but they are cheap, reliable workhorses that will work in a total pinch. Other reviews do mention the mic was a bit too bright and with a lack of bass, but I find that while these are true, there is a crippling 'dullness' that plagues the tone. It's nothing one would notice when listening to it on its own, but pair it up against the standard SM58 and you'll realize that even if the SM58 does have a bit of a reputation for being honky in the midrange and dull sometimes, the XM1800s makes the SM58 seem sharper than a katana. It's like doing a mix of Feeling Good, accepting it, then going on YouTube and listening to any one of the other nine million famous people to ever do it. Then you realize your mix sounds absolutely dull! Oh. Wait. Sorry, I was just moaning about something I did a few months ago. At any rate, the XM1800s is okay in a pinch, but I would never use it in the same show as any well-respected industry-accepting microphone like the Shure SM58. It would just sound embarrassing. So I'll say this: if you're going to use this microphone don't use it alongside anything better. As long as you adhere to this rule, the XM1800s can take you quite a long way. But if you can get 3 mics for $30, you could be doing a LOT worse. It's a pretty versatile dynamic microphone. I use them for 2 years, I like him because they are inexpensive, versatile (drums, vocals). I even made up a beta 58, which gave me a horrible sound on a man's voice. I have 6 and it easily troubleshoot when all other mics (Shure, Sennheiser, ...) are used. Max Chauvinator's review (This content has been automatically translated from French)" I have done, but ..."
Pack includes 3 dynamic with their claws all presented in a small molded plastic case. Mics mostly for vocals and vocal recordings. However, they may agree to catch isolated type instruments or even snare toms. Clearly, microphones at low prices for good quality. I have this set of 3 pickups for almost two years I think. Rather he take the road well, I must say. The sound is okay for a product at that price. Afterwards, if you want something more precise, it is better to turn to a more expensive microphone. But for once, have 3 microphones correct is pretty good in need. Personally, I bought them in a panic on the eve of a "concert" in a mate (which have not occurred). The problem is there at the time I knew absolutely nothing in terms of gear and price range. So I naively bought this pack of micro music store in the corner. The seller tells me the price (120 €) and offers me a discount for not paying after all "that" 80 €. It's there now 2 or 3 months that I fall on the same lot this time about thirty euros. I'll admit that I could not help but shed a tear filled with hatred of rage against the seller who sold me these pickups for almost three times their price (especially since he wanted me to sell even more expensive! ). In short, it was my little personal note. To return to the microphones themselves, I've used both live and repeat that it goes pretty well. Before I had a Power Acoustics I do not even remember the model. I quickly sold because I very quickly acquired the Behringer (3 pickups were more than sufficient). I was able to quickly test a Shure SM 58 live (much better), and I just bought a Beta 58A (even better!) I quickly tested. I obviously prefer the Beta 58A (I also probably would table a notice in the coming months). What I love about XM1800S is its robustness, the on / off button and versatility. The quality / price is more than interesting. At a rate of about 10 € the microphone is more than a case is an offer! I do not regret my choice if it is money that I put. These microphones have been of invaluable assistance on many occasions and it was two wonderful years of ups and downs that I learned to appreciate their company. I recommend this pack to anyone who wants a set of microphones to repeat as for the live. Dynamic cardioid microphones for voice dubbing or amp. Switch. Carrying quilts. Chinese-made good sr. 34 euros (excluding shipping) in Thomman friend. Utiliss by my group for two RPTES. The pickups are quite heavy and look solid. On our small sound system, the XM1800S sound as good as my Shure PG58. The momentum seems lgrement suprieure but less restore the mdiums and treble. In fact the sound of ceremonial XM1800S trs neutral, a bit flat. Advantage: trs low tendency to feedback. Essays also in concert (with a sound system of the same brand): trs well. Much better than the Shure PG48 and CN Previous group. PS: the microphones still alive four years APRS trs abuse (punk concerts flat out). 1 hit by a collgue indlicat (a fan of Behringer?) And two other cabosss but always attack. If c'tait again? Although sr! I use these mics for 3 months. Very useful for annimation but very limited for the songs. Refund a lot of bass. They are used for a year and a few months ... At the beginning they were buying to have a fleet of micro suffiant because we had an SM 58 microphone and another which I do not even know the brand, which delivers bcp too "pop" at each new word! I score above microphone singing but ... but not only, it was used for the recovery of instruments for the models because no budget to invest in micro ADEQUATE ... New surprise, the record is more than satisfactory for both guitars, basses, and for the battery! In short, at 30 € uros the three most micro clamps over suitcase, it's really interesting. We made this choice and we do not regret it at all! we do it again without problems!